Professional nursing organizations are predicting widespread shortages of health care workers in the coming years, as more and more nurses leave the field. State Senator Judy Robson (D-Beloit) says many are quitting because of the mandatory overtime some hospitals require. She says those workers can&apos;t take the strain of frequently have to work a double shift and get burned out. Also, Robson says those long hours can put patients at risk, by increasing the chance of a medical error. The Beloit Democrat is co-sponsoring a bill that would ban the practice, except in major emergencies. 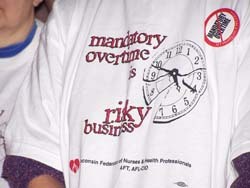 It would also protect nurses from being fired if they refuse to work overtime hours. The Wisconsin Hospital Association opposes the legislation. Spokesman Eric Borgerding says it would make it difficult for hospitals to provide a safe environment for patients and would tie their hands when it comes to meeting staffing needs. Borgerding says the bill also fails to address the other issues that lead to fatigue among nurses, such as voluntary overtime limits or nurses working other jobs. He says both sides should work together on a solution that&apos;s not as limiting as the proposed ban.